This tutorial provides you with a foundation for working with web images in Adobe Photoshop Elements. It is the thirteenth lesson in the Adobe Photoshop Elements 10 Digital Classroom book. Printing is only one of several places your work may be destined. Many people are now posting photos and artwork to their own blogs, web sites, and photo-sharing sites, such as Flickr. In addition, the affordability of video cameras and editing software, such as Premiere Elements and iMovie, has led to an explosion in the production of homemade video. Every digital image, whether it is created with a digital camera, a scanner, or from scratch in a program like Photoshop Elements, is composed of pixels. The word pixel is a conjunction of the words picture and element, and it is generally considered to be the smallest individual part, or unit, of a digital image. For additional information, please refer to Appendix C, “Understanding Digital Files.” There are two main standards for image resolution: 300 ppi is the standard used in the printing of high-quality magazines and books, and 72 ppi is the standard used on the Web and in video. Because these types of graphics are intended to be displayed on screens of varying sizes, the document’s print size is less relevant to understanding how it will appear than its pixel dimensions are. The pixel dimensions tell you exactly how many pixels of screen space your images will take up. For example, if your document’s width is 800 pixels and the viewer’s monitor or display resolution is set to 800 x 600, your graphic will take up the full width of the screen, but if the screen resolution had been set to 1600 pixels wide, it would only take up half of the screen width. The greater the resolution of an image, the smaller each individual pixel in it is and the greater the detail the image can contain. Of the images on the previous page, the image on the left is a grid of 72 pixels per inch while the one on the right contains 300 pixels per inch. The grid on the right contains more than four times as many pixels as the one on the left and can therefore hold more detail. You can view a document’s pixel dimensions from the Image Size window, by choosing Image > Resize > Image Size. The other major area where documents built for print differ from those built for the Web and video is in the color mode. Print documents use the CMYK (Cyan, Magenta, Yellow, and Black) color mode, while those built for the Web and video always use the color mode for mixing colors of light, RGB (Red, Green, and Blue). RGB is an additive color model in which absolute values (value = 255) of each of the primary colors are combined to create white. 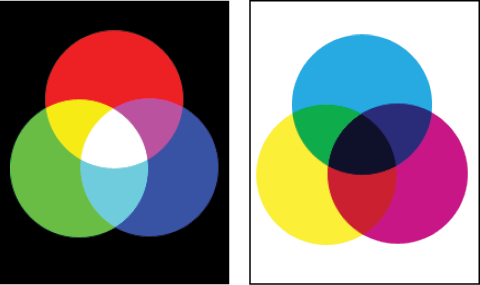 CMYK is what is called a subtractive color model. 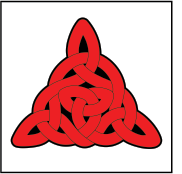 In this model, its colors are subtracted (reduced to 0 percent) or withheld to create the color white. The process of preparing images for the Web is called optimizing. In general, this process involves making sure the file uses the correct color mode and then compressing it to make it smaller so that it loads faster when viewed on the Web. The Photoshop Elements Save for Web dialog box allows you to preview your optimized file and test out various settings to achieve the best result. GIF: An acronym for Graphic Interchange Format, this format is typically used on the Web to display logos, motifs, and other limited-tone imagery. The GIF format supports a maximum of 256 colors, as well as what is called 8-bit transparency, and it is the only one of the three formats mentioned here that supports built-in animation. Each individual frame of an animated GIF also supports a maximum of 256 different colors. The format uses what is known as LZW compression to compress an image without degrading its visual quality, except when it comes to the total number of colors in that image. The two-color illustration seen here would be a good candidate for using the GIF format. JPEG: An acronym for Joint Photographic Experts Group, the JPEG file format has found wide acceptance on the Web as the main format for displaying photographs and other continuous-tone imagery. The JPEG format supports a range of millions of colors, allowing for the accurate display of a wide range of artwork, but it lacks support for transparent pixels. An image with transparency must be matted against a solid color before it is converted to the JPEG format. PNG: An acronym for Portable Network Graphic, the PNG file format was intended to blend the best aspects of both the GIF and JPEG formats while addressing the weaknesses inherent in each format. PNG files come in two different varieties: PNG-8 can support up to 256 colors like the GIF format, while PNG-24 can support millions of colors like the JPEG format. Both varieties of the PNG format use lossless compression to minimize an image’s file size while maintaining the image quality. 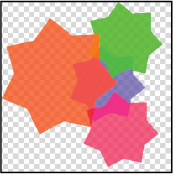 Both varieties of PNG also support transparency, and as an improvement on GIF transparency, a PNG-24 file supports varying degrees of transparency. An image that has multiple degrees of transparency that you want to preserve would be a good candidate for the PNG-24 format. There is one other image format that is supported for display in browsers without the use of a plug-in like Flash Player or Silverlight. WBMP was formerly the default image format for creating graphics to display on cell phones and other devices with limited color displays. It is rarely used.